Of the 437,000 hectares of cultivated land in Odisha’s Mayurbhanj district, nearly 50 percent is classified as upland area. The district’s plateau region, which holds the major share of this upland area remains fallow throughout the year. Some farmers grow short duration paddy during the rainy season every alternate year, but the output remains very low. The tribal farmers growing maize have also met with little success. Without the proper support and guidance on good agronomic practices, the yields are as low as 1.5 tons to 2 tons per hectare. The Cereal Systems Initiative for South Asia (CSISA) has been working with tribal farmers to help them overcome these challenges by promoting adoption of low-cost, best-bet agronomic practices that increase productivity and reduce cost of cultivation besides also establishing market linkages with appropriate buyers to help increase their net profit. For the last 10 years, 41-year-old Chaitanya Majhi, a physically disadvantaged tribal farmer from Kasipal village, has grown maize on 1.5 acres of land using traditional agricultural practices. Last year, Majhi only managed to earn a net profit of Rs. 13,000 (US$ 210) having invested Rs. 8,000 (US$ 129). Majhi’s field had poor plant population since he used a country plow for sowing, did not account for appropriate spacing, practiced poor nutrient management and wasn’t aware of proper weed management techniques. This year, however, he received training and assistance from CSISA to cultivate hybrid maize on the same patch of land using modern agronomic practices. He sowed in a line using a seed drill and at the right time, used herbicides and applied fertilizers at the right time and in the right amount. 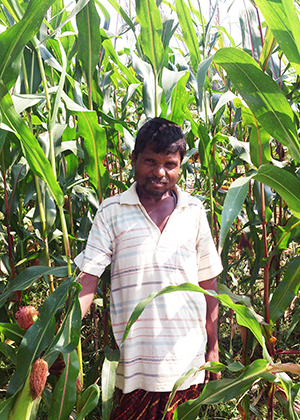 Instead of the standard 1 ton per acre that he was accustomed to, Majhi’s field this year produced 2.2 tons per acre. So, with an investment of Rs. 15,750 (US$ 254) he was able to earn a net profit of Rs. 56,800 (US$ 917) – by doubling his investment he has more than quadrupled his income. Majhi is definitely convinced but seeing his success other farmers in his village are also keen to adopt modern maize cultivation practices next season. In a village not too far from Majhi’s, a women’s self-help group (SHG) is also convinced. The 12 women that comprise the Jay Maa Ambica SHG from Nua-Deogaon village used to rely on work through an intermediary for the local Anganwadi center (government run pre-schools) to supplement their existing incomes. But when that intermediary left, the group lost this valuable source of additional income with which they could more effectively support their families. Initially when CSISA suggested that they try collective maize farming on the 5 acres of land that their members owned they weren’t entirely convinced – not least because this land had not been cultivated in the last five years. But with a little motivation, and a lot of their own determination, they agreed. After land preparation using a tractor, they purchased 40 kg of hybrid maize seed from the state’s Department of Agriculture, which they sowed in a line using a seed drill provided by CSISA. Today, it’s hard for them to imagine how they could ever have been apprehensive. Their investment of Rs. 34,000 (US$ 549) has been already recovered from the sale of 35 quintals of green cob. They’re looking now to earn an extra Rs. 60,000 (US$ 969) by selling 50 quintals of dry grain. And that’s not even their total produce. Beside the financial gains they have achieved, their families have also consumed nearly 5 quintals of the maize during the rainy season – an especially critical time in the region when food security is threatened. Further, these women farmers have also utilized the maize straw as feed for their cattle. It’s not surprising that other women SHGs and their fellow villagers are now asking them a lot of questions on how they too could practice collective maize farming next season.